During our hunt for our current home, our realtor asked me a very simple question: "Do you want a showy home or a homey home?" We had owned a home before, but I had never thought of home-buying in these terms. The whole process was easier after she asked me this question. I wanted a homey home. I wanted to feel at ease, comfortable, safe. I wanted a home where my children could really live - playing, moving, creating, resting and growing. I wanted a light, bright home, but I didn't want vaulted ceilings or a cavernous "great room." I wanted an open feel and multi-use rooms but I also wanted delineated spaces, places to go to be alone and quiet. When we found this house, we only needed a couple of hours to decide it was the right one for us. It wasn't perfect (could any house ever be? I'm not sure) but it was very, very good and we knew we'd be happy here. I've always been a homebody. I would rather stay at home, alone or with some combination of my family members, than do anything else. I think I was born to homemaking; my favorite game was "house" when I was little. Even my Barbies were stay-at-home mothers (in evening gowns). In college, I often stayed in at night, crafting in my nightgown. My friends were bemused but I needed to feel a sense of hominess even in the dorm. Little in life makes me as happy as playing house, even now that I'm all grown up. Simply put, home makes me happy. I am especially enthusiastic about my home in wintertime, when I spend more time in the house. My winter home is simple, with a few basic but important elements. Wintertime is afghans and tea, weak sunshine, warm beds, baking scents, piles of books and magazines, candles in the evenings and a fire on the really cold days. I don't know where I'd be without afghans. I made my first when I was sixteen. I ran out of yarn and it was barely long enough to cover my lap. I don't have it anymore but I have lots of new ones. 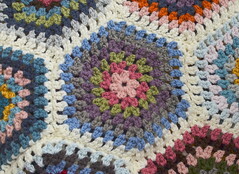 I've been crocheting in earnest for several years now and there are blankets in almost every room of our house. One of the best things about an afghan is the color it can add to a room. 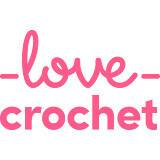 I used very bright colors when I first became reattached to crochet and I felt bold and daring. I was especially unaccustomed to using red. I tend to play it safe with most of my decor, choosing neutral and soft colors for paint, furnishings and linens, but afghans allow me to experiment with color. I love to see my blankets in use. The colors and patterns brighten the room, a loved one's comfort warms my heart. Art is important to me and I fill my home with artwork from many sources. Most of it comes from my children, though, and I am proud to display their work. We have our gallery wall, made with strips of wood embedded with slices cut from wine corks, where I hang the best examples of their artwork. In the winter, this work is always fresh and new because much of it comes home from school after the annual art-and-writing exhibition just before Christmas. There's lots of homegrown art too, things we make together during homeschool time or on the weekends. If you're looking for bold decoration, children's artwork will never disappoint. It's bright and cheerful: slashes of crayon, oil pastel and watercolor, fabric and glue dried lumpy and stiff, garish colors blending in fevered imagination. They make it, I hang it. I couldn't be happier to do so. Saturday afternoons are for listening to A Prairie Home Companion on public radio. This is a tradition from my husband's family and one I eagerly adopted. I love radio and I almost always have a radio playing wherever I am in the house. The show is funny and entertaining and I enjoy the music. My children have listened since they were born; they know Garrison Keillor's voice with just a few words. The show is a way of life, really. Saturdays at four, we switch the radio to KANW 89.1 and settle in. In summer, we sit in shade on the back patio with a small portable radio. In wintertime, we sit in the living room together, listening on our tabletop radio. The kids play on the floor with their bins of K'nex and Legos, the Bear and I craft or read. We listen through the late afternoon. The sun moves across the front of the house, the room dimming and shadows creeping up the walls, light fading to dusty blue and violet as the sun sets. We keep listening together in golden lamplight. This is the first house I've lived in with a fireplace and oh, how I love having a fireplace. As soon as it's cold enough we start having fires on the weekends and we continue as long as we can. The Bear, former Eagle Scout, builds a perfectly beautiful fire and we spend all afternoon and evening in front of it with our various diversions. Sometimes we eat dinner on the floor. We drink cocoa and eat popcorn. Some of the wood is from our own trees, apple and juniper. I love to sit with the lights off, or at least dimmed, and watch the flames and the shadows dancing on the walls. The golden glow of a good fire means coziness and warmth. It's one of the very best parts of winter. In warm weather, I cut flowers from our yard to make bouquets for the house. In winter, I buy my flowers and they are almost always tulips, my favorite flower of all. I love having a fresh bunch in the house and they have to be bright - lipstick red, hot pink, fuschia, flame orange. A bright bunch of tulips in the kitchen, or on the buffet in the dining room, instantly lifts my spirits. It reminds me that spring is coming and that as much as I enjoy winter, the spring holds great promise and beauty and lovely traditions all its own, inside and outside our beloved home. 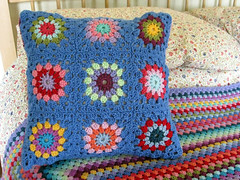 A beautiful post, love the bright crochet and the children's artwork. I always think children's artwork makes a house a home. Lovely post .... So quiet and warm .... have a nice day ! A very special post, Jennifer, and you capture and share the loveliness and warmth of your home and family. You are a born homemaker. A lovely post. All the touches you make to your house make it a home, the children's artwork, snuggly blankets, pretty flowers. I'm just the same, I like my house to be lived in, only then does it become a home. I love all the splashes of color in your home, whether from blankets or flowers. It looks very cheery and inviting! This was such a great post, Jennifer! Your home must be a wonderful place to be - filled with brightness, warmth, and most of all love. There is not much that beats sitting around a fire on a cold winter's day. I love your fireplace. We have one and can't use it for various reasons, all of which will be sorted out this year, I hope. By next winter I will be joining you and can't wait! Such a sweet post. I too enjoy being at home. Wonderful post Jennifer! Please may I come for a holiday, and can every day be a winter Saturday? I'll bring the marshmallows for toasting, and whatever blanket I'm making now to sit in quiet companionship. And when I grow restless I will sit on the floor and build, I'm good with Knex and better with Lego. I loved hearing about your Barbies, and about staying in in college :) My kids always have a mom that stays home, sewing all day - perhaps this will carry over into their later years. Love the artwork display. I'm with you - I always want a homey home over a showy home. Your home is so cozy and welcoming and homey. I've enjoyed this post so much. I love the artwork display and pretty red tulips! What a sweet post, your home clearly is just that, a proper home. I loved this post -glad to have discovered you and thanks for following me. Like you I love sitting by the fire in winter, though right now I'm longing for more daylight. "Apple and juniper" ... what lovely words and what a sweet- and spicy-scented fire they must make! Little beads of brightness, present in the yarn, your children's drawings, dancing flames, or hot orange tulips, can certainly make those cold and chilly winter days feel warm and cozy. Umm, I'm with you on this one, I'm a definately home-body too. I love the description of your afternoons together with the radio, sounds like perfection to me. Beautiful post Jennifer. You clearly are a wonderful homemaker. Oooh can I just move it? Your home sounds so warm and inviting -- especially in the winter. Thanks for a wonderful post! A wonderful post, Jennifer - full of love and contentment and creativity. I love your afghans and know just what you mean about the joy of a real fire. DH and I are great Garrison Keillor fans and often listen to the Prairie Home Companion here too.